Thank you for exploring Ink & Ideas! The word think contains the word ink. Tanny McGregor has been thinking with a pen in her hand, putting words and pictures together for as long as she’s been reading. All kinds of people sketchnote, for all kinds of reasons. By introducing sketchnoting in your classroom, you will provide opportunities for your students to engage with and explore their thinking with what they are reading, listening to, or viewing. 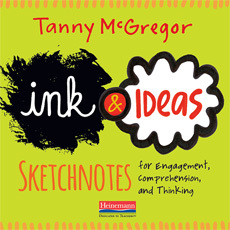 In this sample, you will find Tanny’s sketchnoting FAQs, the introduction, and Chapter 1, which details the benefits of sketchnoting.